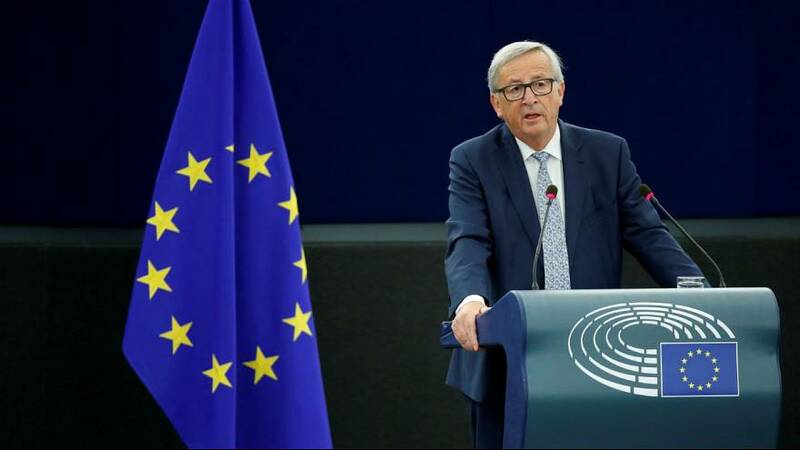 Here are some key points from Jean-Claude Juncker’s State of the Union address to MEPs at the European Parliament on Wednesday, which you can watch again in the video player, above. Juncker packed lots of analogies into his address, especially on how Europe, while economic conditions are improving, should advance the development of the bloc. He said Europe should “not just repair its roof, we need to do all the floors”. “While the sun is shining we need to do everything that is needed, before the next storm comes,” he said, concluding his speech. His proposals included having a common finance minister; getting all EU states to join the Euro; and developing an agency to regulate labour conditions. Juncker’s first mention of Brexit and the fact the UK will be leaving the EU in 2019 brought cheers from some British MEPs. It was very much the elephant in the room for much of the speech and it wasn’t until the end that he briefly covered it. He said the EU would regret the move, and, turning to Brexit architect Nigel Farage, added the UK would as well. “Brexit is not the be-all-and-end-all, we will move on,” he added, suggesting the EU should have a summit on the future of Europe the day after Brexit in 2019. Juncker ruled out Turkey joining the European Union because it had moved away from Europe’s values in recent times. He was particularly critical of Turkey’s jailing of journalists and the crackdown following the failed coup attempt. On wider EU expansion he said it would happen and reserved warm words for Western Balkan states seeking to join the bloc. Europe has suffered massive cyber attacks in the last year, while Islamist extremists have continued targeting the continent’s major cities. It was little surprise, then, that Juncker spoke on this area. He said sometimes cyber attacks were sometimes more dangerous than guns and tanks, adding a new agency would be setup to deal with the issue in Europe. There was a similar solution to tackling terrorism. He said a new unit would be established to improve the sharing of intelligence between member states. He also called for the EU to have a defence union by 2025, something anti-EU voices would refer to as a European army. The EU is to propose ways to increase from 36 percent the rate of failed asylum seekers being deported back to their homelands. This is seen as essential to get member states to agree new rules on asylum to share out responsibilities and give more help to genuine refugees. Juncker wants states to make good on pledges of aid to Africa to promote growth and slow emigration. He praised Italy for its response to the flood of migrants coming to the southern European country, saying Rome had saved the EU’s honour in this area. There was no mention, however, of the EU’s failed scheme to share out refugees already in Italy and Greece to other member states. Romania and Bulgaria should be brought into the Schengen passport-free zone without delay and Croatia as soon as possible — part of a strategy to push all EU member states into all the bloc’s structures, including the euro and banking union. The EU is to launch new, transparent free trade talks with Australia and New Zealand and aim to conclude those as well as ongoing negotiations with Japan, Mexico and South American nations by the end of Juncker’s mandate in late 2019. The EU is taking advantage of a cooling of the United States on free trade. Addressing unease in Europe about such deals, Juncker stressed their power to create jobs and impose EU standards in areas such as the environment on trading partners. New deals will also be stripped of controversial elements such as special business tribunals to make them easier to ratify. What do internauts care most about? We’ve looked at data analysis from Twitter taken during the speech. Brexit, terrorism and the Schengen area were all popular terms among those tweeting about Juncker’s address. One of the most popular tweets was from Juncker’s spokeswoman when, referring to Turkey, he said journalists should be in newsrooms, not jails. 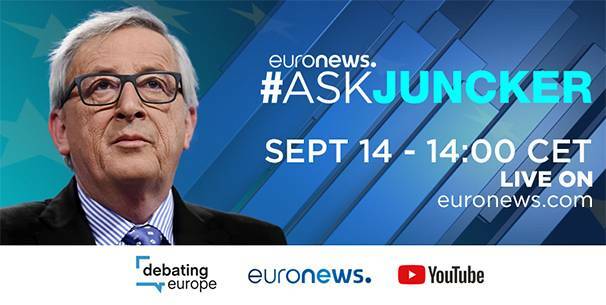 Reality check: has Juncker delivered on his promises?